As shown in the chart below, in the 50 years prior to the effective date of the Trump tax cuts (1968-2017), tax revenue averaged 17.4 percent of gross domestic product, while spending averaged 20.3 percent. With the Trump tax cuts in place, revenue is below the historical average for the next few years, but by the middle of the decade, it returns to that average and then surpasses it as some provisions of the tax cut begin to expire. By 2029, the end of the CBO projection period, revenue reaches 18.3 percent — or nearly one point of GDP above its historical average. We need some serious budget-cutting in Washington. It is time for baseline budgeting to stop. Department budgets need to start from scratch and justify every penny. Yesterday Investor’s Business Daily posted an editorial about the federal deficit and federal revenues. The numbers tell a very different story than the one the media would have you believe. …A true apples-to-apples comparison, the CBO says, shows that the deficit climbed by just $13 billion. So, no, the deficit is not soaring. In fact, the CBO report shows that overall tax revenues climbed by $14 billion in the first two months of the year, compared with the same months last year. Which means they continue to hit new highs. The CBO report shows that combined income and payroll taxes were the same in the first two months of the new fiscal year as they were last year. That’s even though far less money was withheld from paychecks thanks to the Trump tax cuts. It also found that corporate income taxes went up by $5 billion. That’s despite the “massive corporate tax giveaway” that Democrats want to repeal. Why are these revenues flat or up? Simple: The tax cuts help spur accelerated economic growth, which create jobs and spark income gains. More workers and higher wages mean more tax revenues. On the corporate side, a bigger economy means more profits, which even when taxed at lower rates can produce more revenue. This is exactly what advocates of Trump’s pro-growth tax cuts said would happen. But while revenues climbed by $14 billion, spending in the first two months of the new fiscal year climbed by $27 billion. 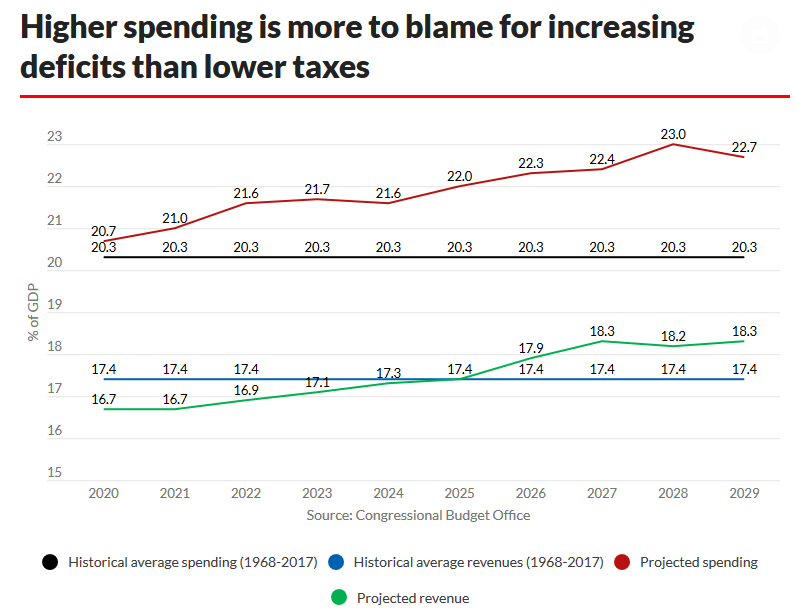 The obvious solution to the deficit problem is to limit spending. If we can’t agree on that, we could lower taxes again to increase revenue further, but I suspect that would really cause some Congressional heads to explode. The Daily Caller posted an article today about changes made to ObamaCare by Congress. The article reminds us that in 2017, the Republican-majority Congress did not have the votes to repeal the ACA, but did set the individual mandate penalty at zero. They didn’t repeal it, but they took the teeth out of it. In 2012, the five conservative justices on the United States Supreme Court (including Chief justice John Roberts) held that key portions of the Affordable Care Act (ACA) exceeded Congress’s constitutional authority under the Commerce Clause. But, Chief Justice Roberts then joined the four liberal justices on the Court in upholding the ACA as a tax under Congress’s taxing power because it generated revenue for the federal government. Such a broad view of “judicial activism” would render virtually any judicial review out of bounds. More importantly, it is contrary to the very system of checks and balances set up by the Founders in the Constitution. There is no Constitutional duty to persuade a majority of Congress to stop violating the Constitution—that’s what makes it a written constitution in the first place. And there is the rub. Judicial activism, rightly understood, is when a court tries to exercise the legislative function — i.e., when a court writes laws instead of saying what the law is. But asking courts to carve out the unconstitutional provisions from laws is exactly that. Advocating for severability asks the judicial branch to judge the law Congress should have written, not the one it did. A more restrained approach would be to strike down the whole law and let Congress decide whether it wants to pass the law again without the unconstitutional provisions included. An old saying goes something like: “When you mix a cup of sewage in a barrel of wine, you end up with a barrel of sewage and have to throw the whole thing out.” To extend the metaphor, courts shouldn’t be in the business of sifting through a law to pick the sewage out of the wine, they should throw the whole thing out. Striking down unconstitutional laws is not judicial activism, and it is well within the role of the judiciary to strike the entire ACA as such. It is definitely time to get rid of the barrel of sewage! Yesterday CNSNews reported that according to the the Budget and Economic Outlook published January 31, 2012, by the the Congressional Budget Office (CBO), the amount of taxes collected by the government will increase 30 percent between 2012 and 2014. That increase is not due to a growing economy, which automatically increases the amount of revenue flowing into the treasury, but due to an increased tax burden placed on every American. 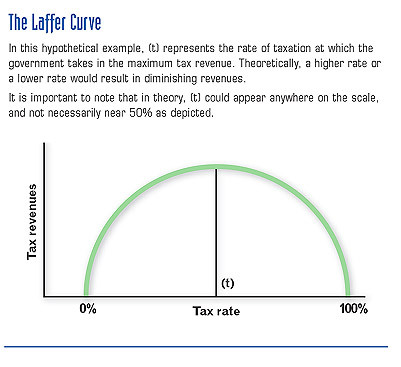 The anticipated percentage increase in federal tax revenue is not only large when calculated in dollar terms but also when calculated as a share of GDP. The jump from 15.4 percent of GDP in fiscal 2011 to 20.0 percent of GDP in fiscal 2014 equals an increase of 29.8 percent. The jump from 16.3 percent in fiscal 2012 to 20.0 percent in fiscal 2014 equals an increase over two years of 22.7 percent. Federal tax revenues have averaged “about 18 percent of GDP for the past 40 years,” according to CBO. So, in the next two years federal tax revenues will rise from a level that is below the modern historical average to a level that is above it. A revenue increase that was due to an expanding economy would help us deal with our deficit problem (although the spending–not the revenue–is at the root of the problem). 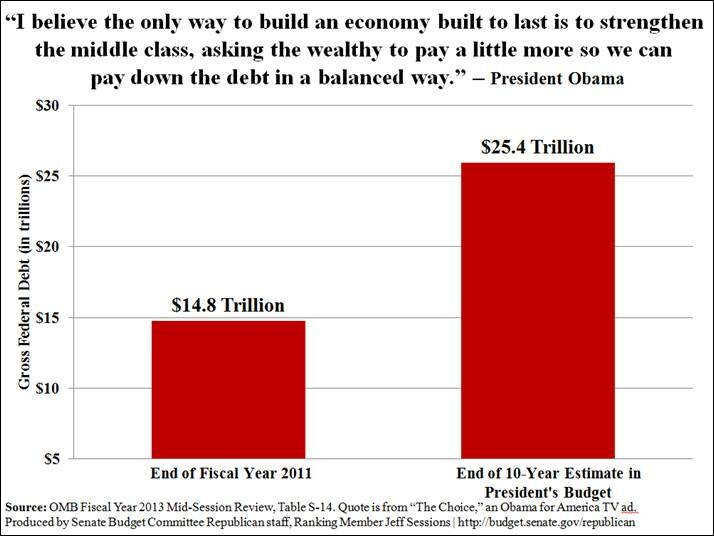 As long as the government spending is out of control, the economy will not grow. Right now our economy is the equivalent of a hamster on an exercise wheel–until the hamster gets off the wheel, he is not going anywhere. The American economy cannot survive this kind of a tax increase. It is time for everyone to take a good look at their Senators and Representatives and examine their voting record over the past ten years. If they have consistently voted to increase government spending, they need to be voted out of office in November–this cannot wait any longer. Americans will get the government they deserve (the government they vote into office). If you would like to see America survive, you need to be part of the solution–not part of the problem.